Fergie or Stacy Ann Ferguson is a popular American singer and even an actress now. She is a woman that is worth admiration. She is pretty, clever, artistic, talented and original. Only thanks to this features Fergie became the world known singer. In childhood Fergie liked dancing. She constantly took part in a great number of competitions. Her bright appearance and perfect dancing drew attention of producers of Kids Incorporated. Very soon she became popular among children of her age and was offered to sing in the band Wild Orchid. It happened at the beginning of 90th. She sang in this band during almost ten years but later she confessed that she left this band because she didn’t like the image and repertoire of it. At the beginning of her career she had curly, fair hair and wore a fringe. She was a cute and pretty girl and her curly hair added charm to her look. For the first time the audience heard about this singer when she was a principal performer of popular band Black Eyed Peas. She had got the experience in Wild Orchid, so in a new band she came prepared. It doesn’t matter where she is, she always looks perfect. This is the case of her hairstyle as well as her manner of dressing. Fergie is such a kind of woman who is proud of her long hair. So during her career she couldn’t boast by any drastic changes. 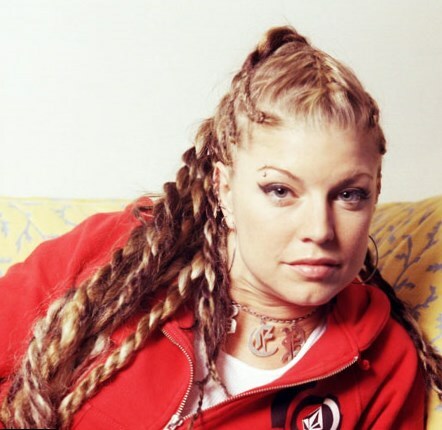 But Fergie also doesn’t like sameness and some changes with a hair style she did. If to have a look at Fergie’s photos at the beginning of her career and now we see that she changed. She became more elegant. In 1998-1999 she preferred long and strait hair without fringe and almost everywhere at any social event the admirers saw her without any complicated hair combs. Later in 2002-2003 she was more often seen with wavy hair and surely she dyed her hair blond. She did it in order to make it brighter. Also Fergie liked accessories. In 2003 at MTV Europe Music Awards she came with an interesting hair comb and complemented her charming look with a bright red rose in her hair. Speaking about Fergie’s style it ought to be mentioned that it doesn’t depend on outfit she chooses for this or that event. It could be either glamorous or sporty. She always keeps her individuality. In 2004 she frequently was noticed with either ponytails or bunches. Very often her ponytail or bunches were decorated with some rather bright accessories. The most drastic change of hairstyle was in 2009 when she coloured her hair and became brunette. Surely this new image feats the singer greatly and adds her elegance, delicacy and sophistication. It seems like Fergie felt uncomfortable with a new hair style and soon she brought back into blonde colour again. Though this singer cannot boast any drastic changes with hair style, she managed to do almost impossible thing for Hollywood celebrities. During the years of her career (now Fergie is forty) she could keep her womanhood and delicacy.